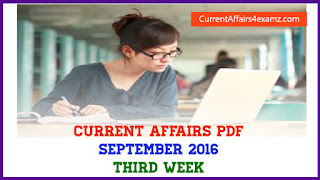 Hi Aspirants, here is the Current Affairs Quiz for 13 September 2016 useful for bank exams, ssc exams, upsc exams etc. 1. 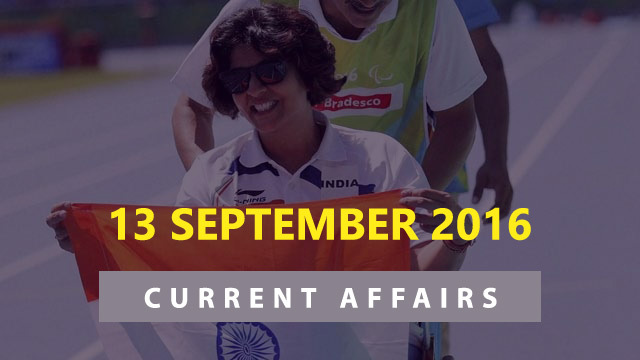 Deepa Malik, who won silver medal at Rio Paralympics 2016, is associated with which sports? 2. Uttar Pradesh government recently named which actress as the brand ambassador of the Samajwadi Pension Yojana? 3. The 2016 International Buddhist Conclave will be held in which country? 4. Angelique Kerber who won the US Open Women’s Singles title 2016 belongs to which country? 5. Which stock exchange recently became the first Indian stock exchange to file Initial Public Offering with SEBI? 6. Which state government has officially launched AIR Regional News Unit (RNU)’s Facebook page? 7. Stanislas Wawrinka won the US Open men’s singles title 2016 defeating whom? 8. World’s first robotic operation inside the eye was successfully performed recently in which country? 9. Cauvery water which was in news recently is between which two states? 10. Which Indian state was recently adjudged as the cleanest state in terms of rural sanitation?